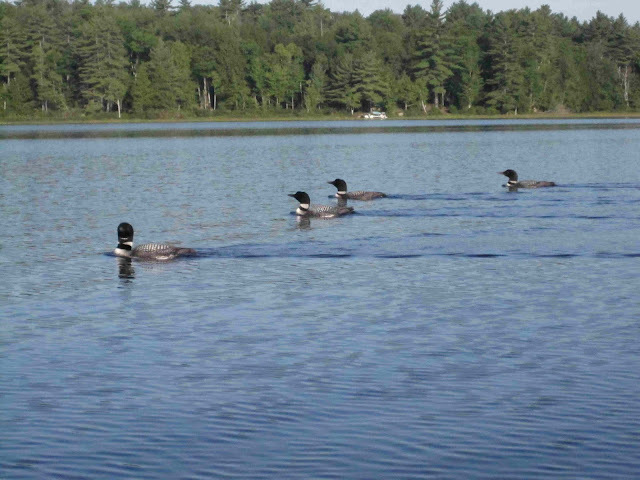 A couple of fabulous late summer days on Lake Wicwas, with lots of activity on the lake - people and animals. This morning while fishing we saw three loons fly in together. A few minutes later we saw a fourth had joined them and they swimming together in the morning light. 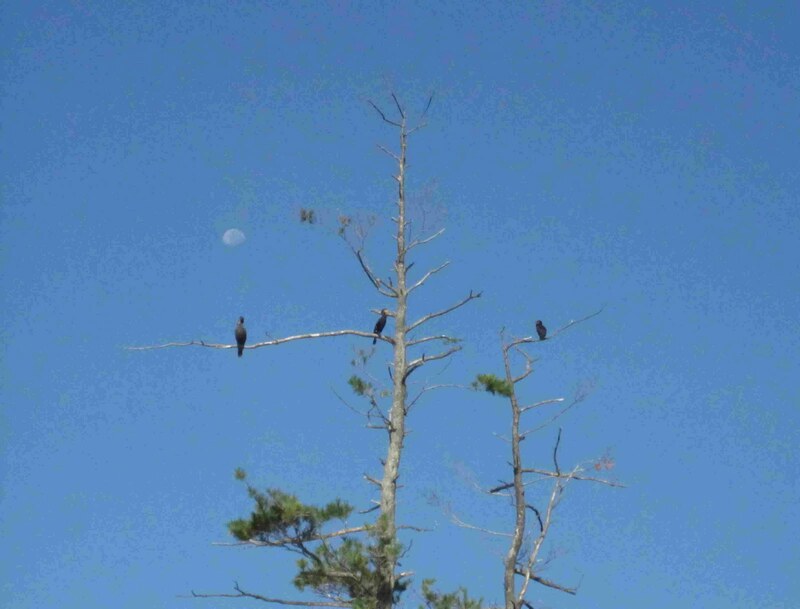 Passing by the small island in the middle of the lake we saw this sight of three Cormorants sitting in the top of tree in front of a waning Gibbous moon (the last few nights have been beautiful under the bright moonlight). This is their favorite tree on the lake, as I often see them here. I've heard they kill the trees the roost in; I don't know if that's true, but this tree certainly supports the argument. A day or two ago our resident fisherman had some competition from an Osprey fishing by the two red markers; he clearly saw an Osprey, as he was startled by it crashing into the lake. Osprey are regular visitors to Lake Wicwas, but they don't seem to stay very long; every couple of years I see one for a day or two, and then it's gone. They are the only bird-of-prey that actually dives into the water to catch fish, making a loud and visible splash, where hawks and eagles pluck their prey out of the water with their talons as they fly over the surface. Last evening we watched two bats for a long time flying around the cove collecting insects. Although fewer than prior years, a few of them are hanging on. It's sad to think summer is coming to an end. School has started and the kids are going back to college. Some of us took our last ski for the year, and as Dustin took his final boat ride around the lake we saw two very large hawks soaring low over us, as if they were saying goodbye. They started just at tree-top level, and without a single wing flap rose well up into the sky. They were clearly enjoying the thermals from the west winds going over the cooler lake then hitting the warm shore line.